Truth and Light: Doctrine and Covenants Lesson 28 "O God, Where Art Thou?" Doctrine and Covenants Lesson 28 "O God, Where Art Thou?" 1. What do you make of/how do you feel about Joseph Smith's prayer? 2. Why does the Lord take so long to answer some prayers? 3. What advice does the Lord give Joseph at this most desperate and frustrated stage? 4. 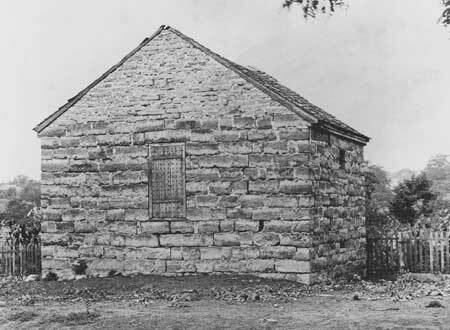 What can we learn from the experiences of Joseph Smith and others in Liberty Jail? What brought the Saints to this point? In 1836 The Saints were expelled from Clay County and given lands in Ray and Davies Counties to settle including a settlement called Far West. In 1836-1837 two missions were opened - Canadian and British. This brought hundreds of new converts (including a young John Taylor among others) that were eager to be part of the frontier movement and growth of the church. Additionally, facing apostasy and rebellion in Kirtland, the faithful saints there abandoned their temple and joined up with the Saints in Far West. By 1838 the Saints in the Far West region numbered over 8000. Far West temple cornerstones dedicated but temple never built. Mormon and State militias are organized. Battle of Crooked River - apostle David W Patten is killed as is a state militia man. Oct 1838 Boggs issues his now infamous "extermination" order declaring Mormons must be driven from the land or exterminated. Oct 1838 Hauns Mill Massacre 17 saints murdered while locked in a barn. Nov 1838 -Mar 1839 over 8000 saints are forced from their burning lands and homes. They travel east into Illinois to escape Bogg's extermination order. Question 1. What do you make of/how do you feel about Joseph Smith's prayer? Is this murmuring, or lack of faith or is it the point the Lord needs us all to reach before he can teach us at the next level? …No one but God, knows the reflections of my mind and the feelings of my heart when I left our house and home, and almost all of everything that we possessed excepting our little children, and took my journey out of the State of Missouri, leaving you shut up in that lonesome prison. But the reflection is more than human nature ought to bear, and if God does not record our sufferings and avenge our wrongs on them that are guilty, I shall be sadly mistaken. . . . He must be heartbroken. Frustrated. And in this lowest of lows he cries out "O God, where art thou?" Have you ever reached a point like Joseph where you still believe, you still have faith but you just don't know if you can go on, where the trials you are burdened with seem to be more than you can bear and you feel alone - all alone. These are watershed moments. By watershed I mean moments where water must be shed - tears must be lain at the altar of sacrifice. The Lord wants us there. He wants us broken and humbled for it is then that we learn and grow. Again I ask - have you been there? Have you been to that place where you cry out and the tears are streaming down your face and you utter a prayer you have prayed for days or weeks or months but this time it is different for it is consecrated with tears and something in your cries reaches just that little bit deeper than before. That is where the Lord needs us to go. That is why the Lord takes so long to answer some prayers. Peace be unto you - stay calm, don't panic and whatever you do, do NOT get out of the boat! cf Mark 4:35-41 Sometimes the Lord calms us down and sometimes he calms the trials down. Either way it is all in His time. Endure it well - how do you endure trials "well"? Hold on thy way - keep doing what you know is right, don't start doing anything crazy like jumping out of the boat! Fear not what man can do - in these moments of despair we often feel abandoned to the whims of the devil but here the Lord clearly indicates that his sheep are numbered and he knows them by name. He will not abandon us. My testimony is that good things will always come to those that are righteous and can wait on the Lord. Just hold on.